Those of you who have been watching this blog for a while - waiting for updates on the European ELV (End of Life Vehicle) legislation - wait no more. The Öko-Institut, the Fraunhofer Institute and Eunomia Consulting, which the European Government had commissioned to jointly gather and comment on informed opinion on the derogations (legal allowances(1)) for the use of lead (Pb) in automotive applications, has finally released its findings to the public. 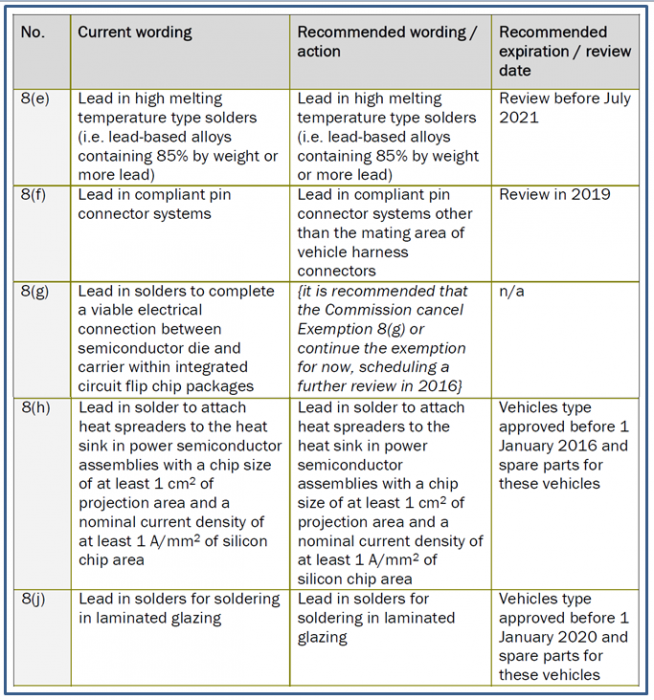 While the majority of these solder applications are clearly sunsetting, the biggest surprise is the length of time that both the DA-5 consortium (Infineon, Bosch, Freescale, NXP and STmicro) and the ACEA, CLEPA, JAMA, KAMA associations have given before the next review of the high-lead (>85%Pb)) applications (exemption 8(e)): that is, 7 years (from 2014 at time of writing)! Judging by the timescale of the DA-5, this means that the next die-attach industry consortium (DA-6? DA-5.1? DA-5-TNG?) will assemble and begin its work again in 2016, and with the 2021 deadline for the final report out, that makes high-lead solder usage good until at least 2023. In my next blog post, I will run though some of the discussions relevant to the 8(e) exemption, and how Indium Corporation's BiAgX(R) solder paste technology, currently ramping in live product at two different Power Semiconductor customers and proven to MSL1, will allow automotive, enterprise, and mobile device manufacturers to meet their own customer's needs for reliable high-temperature-capable Pb-free devices.